"Old Church of St. Augustine, Isleta, New Mexico"
Old Church of St. Augustine, Isleta, New Mexico - The heavily Buttressed, fort-like Mission of St. Augustine of Isleta dates back to 1605-1617 and is therefore as old as any in this county. The edifice is over 100 ft. long, and adjoining it is a series of rooms or conventos built around a patio, bright with flowers and shaded by old trees. A tapia encloses the churchyards. 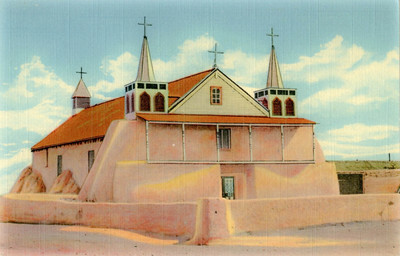 Linen postcard with divided back published by SouthWest Postcard Company, Box 685, Albuquerque, New Mexico and printed in the United States by "C.T. Art Colortone" made only by Curt Teich & Co. Inc., Chicago, Illinois.